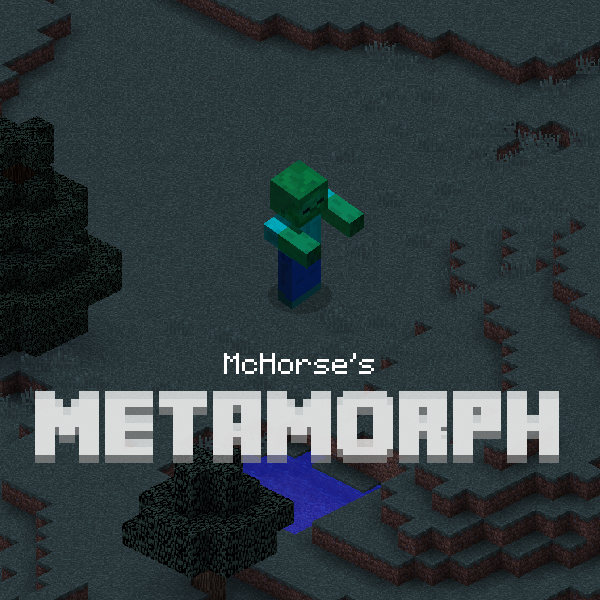 Metamorph (from Metamorphosis ) – a Minecraft mod which allow you to morph into mobs. Most of vanilla mob morphs have their abilities (preconfigured), meanwhile most of modded morphs only grant you appearance and some attributes like health, unless configured. Morphs can be disabled and configured. See mod's wiki for more information. Heavily inspired by iChun's Morph mod and zacuke's Shape Shifter Z mod, and works only with Forge for Minecraft 1.10.2, 1.11.2 and 1.12.2. Q: My screen goes up and down. How to fix? A: Most likely you installed MorePlayerModels mod alongside Metamorph. To fix that, either go to Mod Options > Metamorph > General and enable Disable POV option, or disable POV option in MPM's config and restart the game. Install Minecraft Forge, download the latest stable version of jar file for available minecraft version. Also install following mods: McLib. Put it in minecraft's mods folder, and launch the game. After that, Metamorph mod should be installed and will appear in Minecraft's mods menu. If Metamorph didn't appear in the mods menu, then something went wrong. To morph into other creatures, you must to acquire a morph first. To acquire a morph, you have to kill a mob, then a ghost of a mob will appear (that's a morph), and when you'll pick it up, you'll acquire a morph. Once you have at least one morph, you're able to transform into that morph. Use [ and ] keys for advancing through the list of morphs. There are also ' and \ keys for switching between morph variants (you'll see up and down arrows in the selection box if there are morph variants available). Use enter key for transforming into selected morph. To demorph, you scroll left until you focus character with your skin, and then press enter to demorph. Or you can press demorph key (which is . by default). You retain your morphs even after death (although you can disable retaining of morphs after death in mod options). In creative mode, you can select almost any available morph via Creative Morph Menu which can be opened by pressing B key in the game. Survival Morph Menu can also be focused, for managing purposes, by pressing N key (default). There you can favorite, remove and filter morphs by favorites. You use the same keys to navigate morphs ([, ], ' and \). Attack is an effect which is applied onto attacked entity. For example, if you hit some entity while being in CaveSpider morph, your target will gain poison potion effect. If you'll hit an entity while being in VillagerGolem morph, you'll throw your target high in the air. Action is a special ability that is triggered by "action key" (which is V by default). Examples: in Rabbit morph, you'll jump high; in Creeper morph, you'll explode like a creeper, and so on. Don't distort the mod name. It's the Metamorph mod. Make sure that information and description of my mod is legit. Misleading information, like Minecraft version support or non-existent features, is your responsibility. By uploading a custom build of this mod, the build becomes your responsibility. Provide the source link, please. CurseForge page is preferable. Provide a link to my YouTube channel, please. This will be really appreciated! You can use Metamorph banner or cover for your repost page. Don't apply the watermark, though, that's just rude. Also, I would really appreciate if you will support me on Patreon! If you found a bug, or this mod crashed your game. I'll appreciate if you could report a bug or a crash to me either on issue tracker, on PM or on Twitter. Please, make sure to attach a crash log (pastebin please) and description of a bug or crash and the way to reproduce it. Thanks! Quick question! So, when you edit the pose of your limbs, is there any way to make it static? So the limbs won't wiggle around all weird when you move? I searched for a way to do this but can't seem to figure it out. I'm confused because I've seen static player poses in review videos, but it might have been for different versions. If this isn't available in the 1.12.2 version, it'd be awesome to add! I also realize this might not be the right mod to post this on, I'm not quite sure if it's this or Blockbuster that adds the posing of live actors /: So sorry if I've got the wrong place! Anyways, to make the model not swing while walking, you'll have to create a separate model that doesn't have "Swinging" option enabled. Open model editor (see Controls > Blockbuster), then select the model you use (fred, steve or alex or whatever), then open limbs panel (second right button from top) and while separately selecting the limbs you want to disable swinging in the list, click on the "<" button and uncheck "Swinging". Save the model in the models panel (floppy disk icon) under a different name. That's should be it. question? when you become a mob are you no longer targeted? It depends on the mob, but for most vanilla mobs, you will not be targeted. For modded mobs, "hostile" defaults to false so you will be targeted, however this is configurable on a per-mob basis; check the wiki. Metamorph is a very lightweight mod which does not change worldgen or add any blocks or items. You can safely add and remove the mod without any long-term side-effects. Are you sure that Forge is installed? Then you're doing something wrong. Thousands of people downloaded this mod, and have no problem. Uh hey dumb question that's not really about the mod itself. What mods are you using in your showcase of Metamorph 1.1.4 ? I swear the gloves in first person are rendered differently than they usually do. Thanks ! It's an okay question. If I remember correctly, I used all of my mods, MacroKey, and that's basically it. Edit: forgot to mention that the model is made by me and it's working through my Blockbuster mod.